Mandu, Mandavgarh or Shadiabad, the land of happiness, is an ancient ground that has weathered the ravages of time and nature. 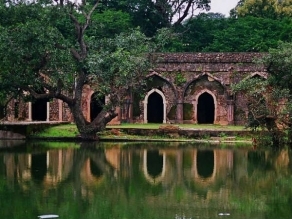 Today, Mandu tourism offers a getaway second to none. With traditional Malwa cuisine, with the daal baati and malpua and the Malwa festival organised by the Madhya Pradesh Tourism Department, an authentic holiday in yesteryear beckons travellers. Mandu tourism is owed largely to the doorways to history that regularly dot the landscape in Mandu. 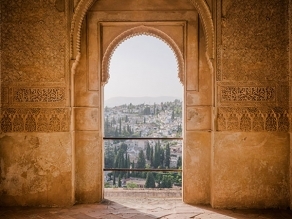 The walls of the town enclose a number of architectural marvels like the darwazas, the masjids and the mahals with each one of them boosting Mandu tourism and keeping history alive. The Roopmati Pavilion with its association to a timeless love saga is a must see along with the magnificent darwazas, the gates of the fort that forms the entrance to the land of monuments. Hoshang’s Tomb, the first marble structure in India and a resplendent monument that served as the inspiration for the Taj Mahal, is but a humble part of the tourist places of Mandu. Each succeeding ruler in Mandu may be recognised simply from the buildings and memorials that survive to this day. Mandu was a small kingdom ruled over by the Afghan ruler, Dilawar Khan. Hoshang Shah, Dilawar Khan’s son, elevated Mandu from a small kingdom to a resplendent thriving kingdom. With Akbar defeating Baz Bahadur, Mandu became a part of the revered Mughal Empire till the empire was conquered by the Marathas in 1732. 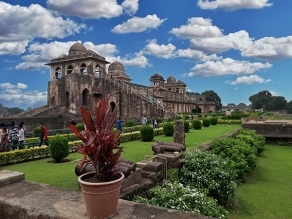 Travelling to Mandu is easy as the place is well connected by road, air and railway. Monsoon beckons tourists with pleasant weather and light showers that are refreshing. Hence, it is the ideal season to holiday at Mandu. The national highway network and state highway network in India connect reasonably well most cities and towns of importance. Mandu is well connected to Indore and Bhopal by road. Buses between Mandu and Indore and Bhopal run regularly and are reasonably priced. Cars may also be rented in Indore and Bhopal. Mandu is a small town that is remote yet perfectly approachable by air, rail and road. The nearest airport to Mandu is the Indore airport at a distance of one hundred kilometers. The airport has regular flights from all major cities in India including Delhi, Mumbai, Gwalior and Bhopal.